The son of a Mexican-American mother and an Anglo father, Johnson ponders life as a “mixed-race” man in the racially charged atmosphere of America. Johnson (Law/Univ. 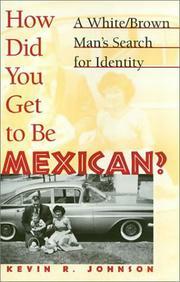 of Calif., Davis) grew up uneasily among ethnic contradictions. His mother preferred to describe herself as “Spanish,” rather than acknowledge her true heritage; even so, his father, a blue-eyed blond, urged him to embrace his Mexican heritage. In an era of affirmative action, Johnson felt highly conflicted about “checking the box” on college and law school entrance and loan forms and thereby profiting from an ethnic heritage that he grew up freely embracing. He felt just as uncomfortable with Anglos who didn’t know his ethnicity as he did with militant Chicano activists who might doubt his bona fides. But Johnson regarded the painful plight of his mother’she was stricken by clinical depression and getting by on welfare after her two marriages had foundered—as a negative example of what can happen to people who are forced by racism to deny who they really are. The bulk of the book is taken up with Johnson’s intellectual autobiography, tracing his own uncertainties as questions of identity exacerbated the problems of adolescence and early adulthood, and then following his career as a lawyer and law professor more secure in his racial identity, though still not without self-doubt. Indeed, the most appealing aspect of the work is the author’s candor about his insecurities and personal dilemmas. But bland writing fetters Johnson’s intelligence. To put it bluntly, he writes like a lawyer. A thoughtful story, told somewhat indifferently.